What does juggling have to do with science? 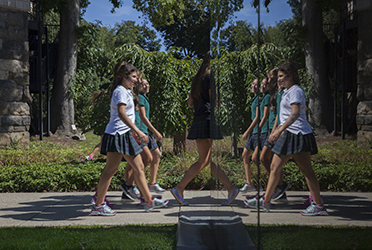 As the Lower School girls learned this week, it's an excellent tool for teaching the basic concepts of matter! 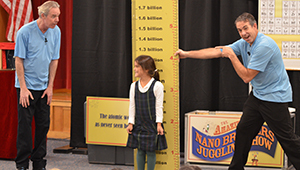 The Amazing Nano Brother, expert jugglers who are passionate about science, performed at this week's Lower School assembly. Not surprisingly, they started their presentation with an explanation of the "nano" prefix, teaching the girls that a nanometer, the scale at which things are measure at the atomic level, is one billionth of a meter. The girls were absolutely captivated by the Nano Brothers, who juggled everything from bowling pins to house plants to a full-size bird bath. With a student assistant to represent the nucleus of an atom, they juggled balls between themselves to demonstrate the movement of electrons. The girls learned that there are 118 types of atoms, known as elements, that are the building blocks of all matter in the universe. The brothers also used their juggling skills to illustrate how atoms bond to form molecules. And when one of the brothers rode around Young Assembly Hall on a 7-ft tall unicycle as a proxy for a scanning probe microscope, the girls were delighted. 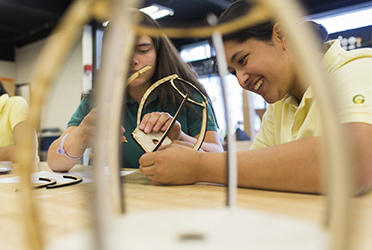 The Nano Brothers took a topic typically reserved for middle and high school students and made it accessible, engaging, and enjoyable for the Lower School girls.